At Scrimshaw we fully embrace a wanderlust lifestyle and try to incorporate it in our daily lives. Wanderlust is more than just a desire to travel; it is a way of life that forces you to break a routine and allows for the discovery of the unexpected. 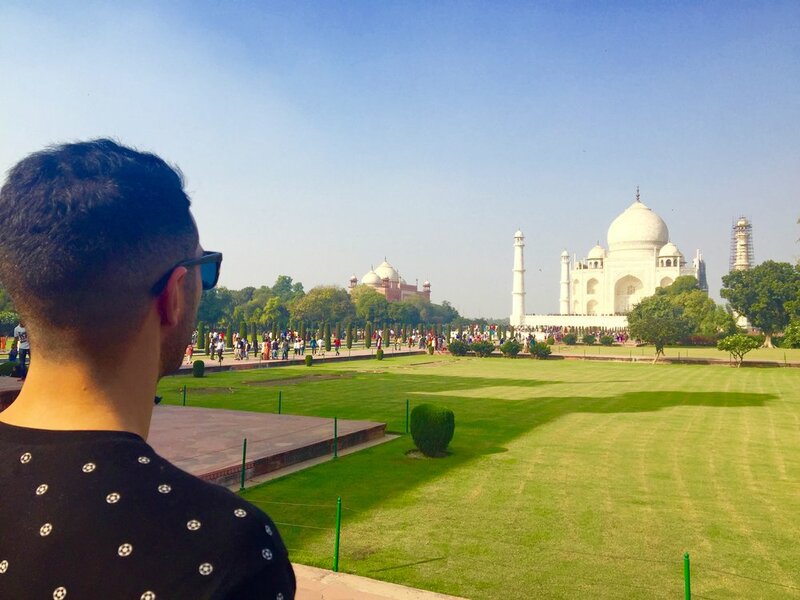 Turning our desires into reality, Scrimshaw recently went on an adventure and took a trip to India. True to our style, we packed the trip to the brim with culturally fulfilling and classic tourist experiences. 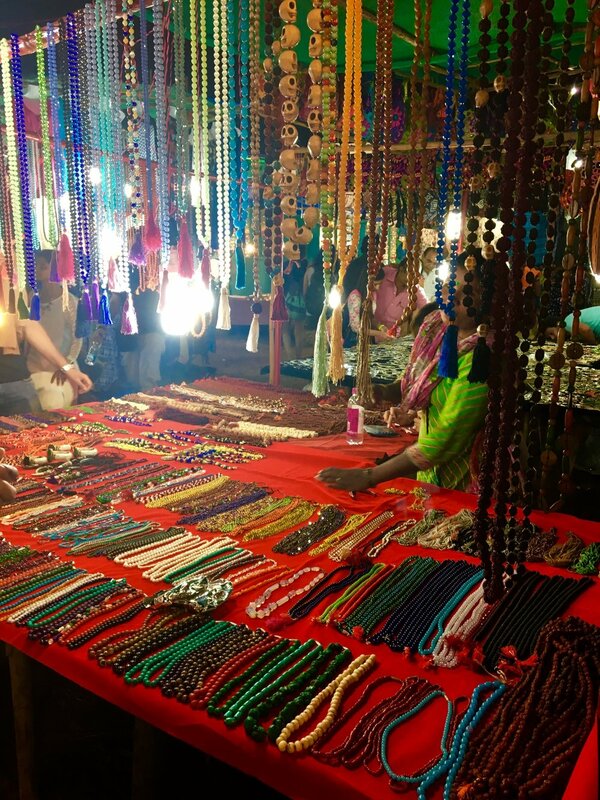 While the trip was amazing and full of unique experiences (some of them just for us to remember), nothing quite captured the sights, smells and tastes of India like exploring the Saturday night market in Arpora, Goa. Goa is a state on the western coast of India known for its beaches, clubs and the enormous amount of Russians that frequent it’s resorts. 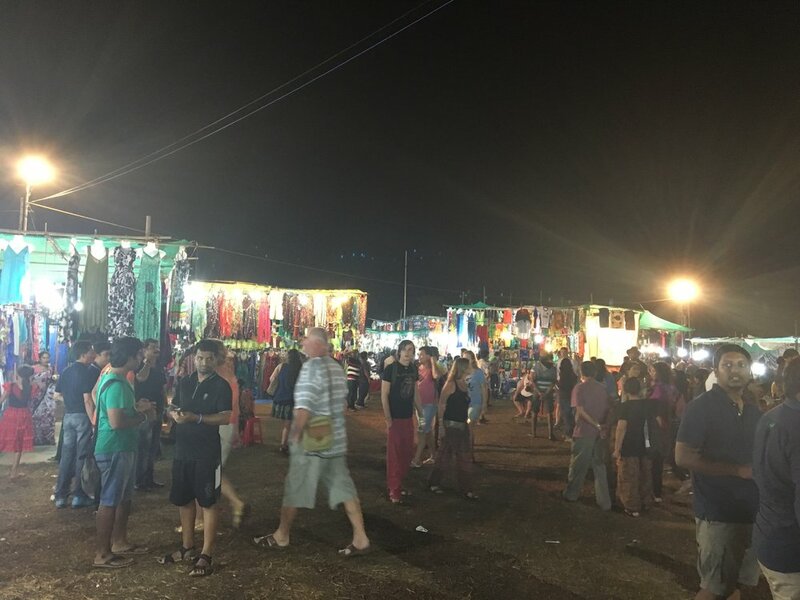 However, rather than hitting up one of the Western nightclubs that dot the shores, we decided to venture further inland to one of Goa’s lesser known attractions - the Saturday Night Bazaar. We were initially lured to the bazaar by the promise of the best chicken we’d ever taste. Thus started our quest inland. But, upon taking a few steps into the brightly lit market, we were quickly led astray from our charted course by a spice merchant. 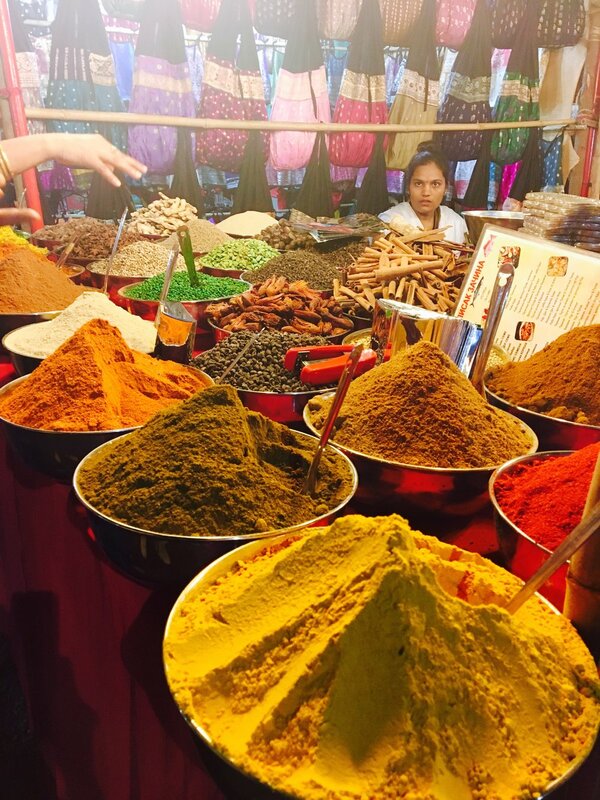 Piles upon piles of spices of every imaginable color were overflowing in baskets on the merchant’s table. It was stimulation overload between the aromas and vibrant colors. The merchant invited us to smell, then to taste. Immediately, flavors of earthy turmeric, smoky cumin and spicy masala chai consumed us. He promised that adding a dash of any of these spices to our cooking would immediately transform even the blandest dish into an Indian specialty. Bland, being the key word here, as we found that this is how Indians refer to most Western food. We had our doubts, but it was hard not to believe that spices as pungent as these would do at least something to our cooking. We decided to buy four of our favorites – fresh turmeric and mustard seeds for curries, and cloves and cassia for homemade chai. Then came the negotiation. 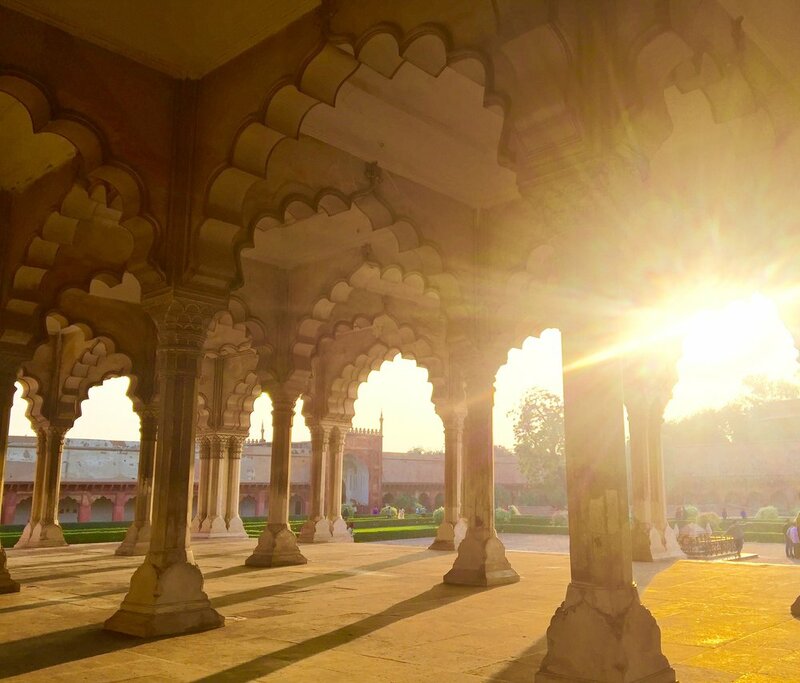 We found that the price of everything in India is debatable – hotels, cabs, clothes, drinks, you name it. 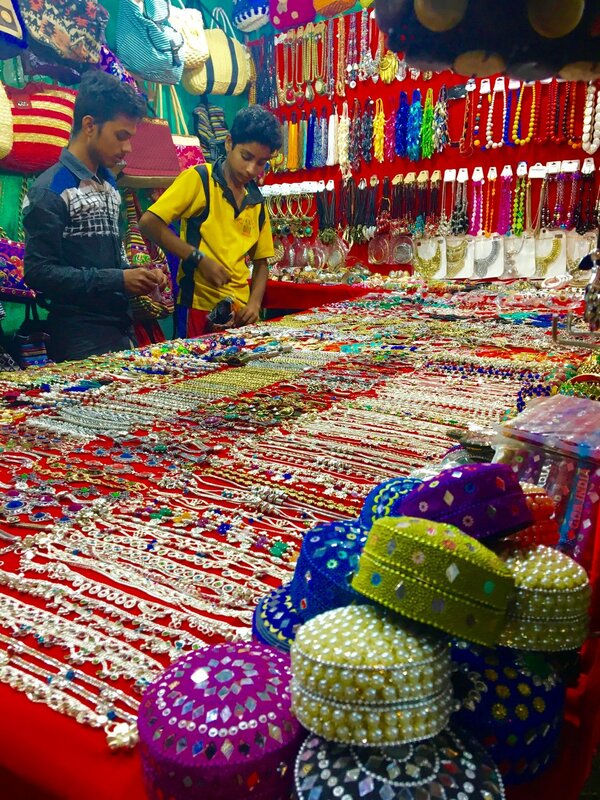 Certainly all items at the bazaar were negotiable, with every merchant’s goal to extract as many rupees from each potential customer as possible. Indians are born negotiators, and know to take advantage of our Western acceptance of named prices (but we came prepared). 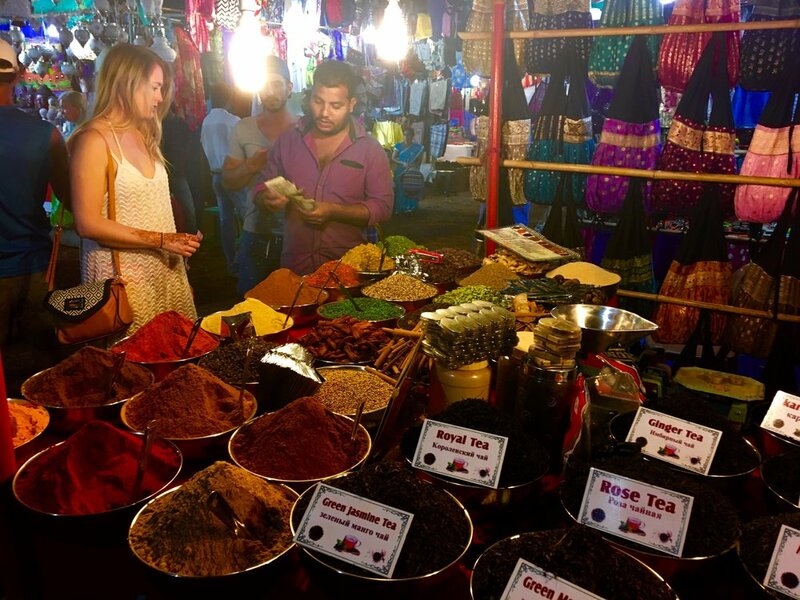 We were given the inside scoop on how to price it out, and much to our success, ended up walking away with our spices for 100 rupees each, down from 200. WIN! Not bad for spice bags that were promised to revolutionize our cooking. We continued to wander through the various tents as our group quickly dispersed in multiple directions. 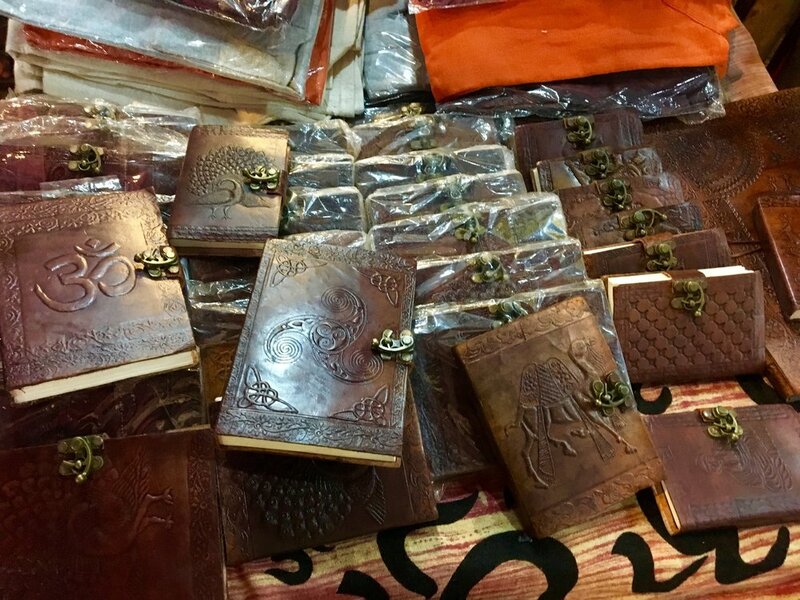 We ran our hands over beautiful silk and sequined sarees, tried on beaded necklaces and gold bangles, and flipped through journals with Hindu gods imprinted into the leather. Perhaps it was the day spent on the beach drinking endless Kingfishers, or just delirious from our sunburns, but we felt intoxicated by the energy and romance of the bazaar. 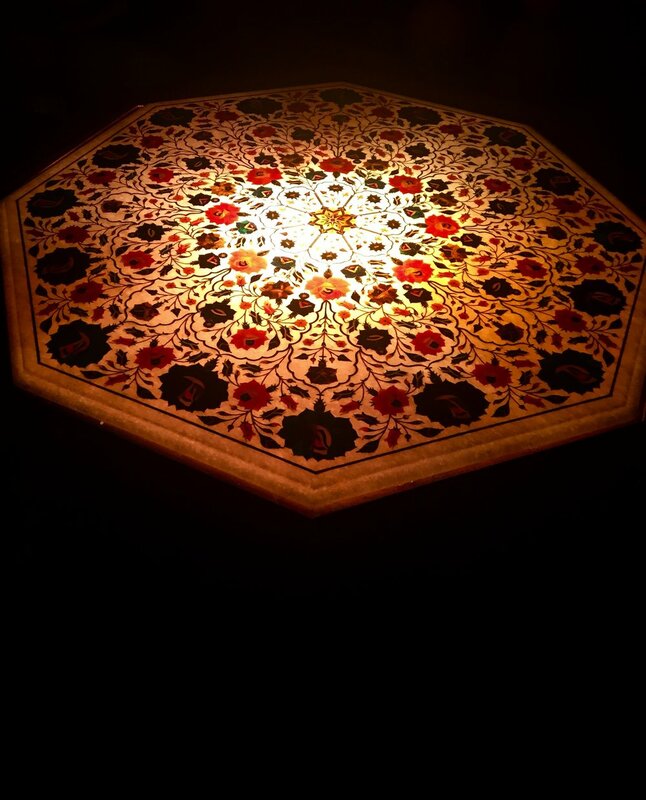 It was one of those experiences where the cultural energy wasn’t lost upon us as travelers. We even immersed ourselves a step further and got into the moment by beating on a bongo drum in tandem with a drum merchant. But like any good adventure or quest, derailed by intoxicating smells, colors, and merchants, we had to get back to our original goal, which to find this legendary chicken. We collected ourselves, rounded up our companions, and made our way to the food tents. As we finally reached our adventures goal, we came to a moment of panic. Due to the cash crisis between the government and our own habits (excessive beach drinks: Kingfishers), we had limited funds left. The Indian Government recently discontinued the 500 and 1,000 rupee notes to crack down on corruption and bring illegal cash holdings forward! Craziness. Cash was scarce during our stay, and it was not uncommon to see 30-40 people standing in line for an ATM at any one time, which truly gave us a unique perspective as outsiders. We had about 1,500 rupees left, which sounds like a lot, but that’s only little over $20! This would barely cover one person’s dinner in the States, but in India, we were able to get a feast for four (again, perspective). With the tent’s aroma and our travels with minimal stops for food, we were ravenous. Of course our eyes were bigger than our stomachs and ordered all the chicken legs, thighs, wings and breasts we could eat, as one does when they are presented with infamous Indian Chicken. The chicken was barbequed on grates over a charcoal flame, with huge amounts of sauce slathered on. The sauce would drip into the fire below, making a hissing noise and sending up smoke, not only teasing the taste buds but also heightening our other senses as well. We asked one of the cooks what was in the sauce, but he smiled but said nothing. Such a cool moment. Someday when someone asks me a question about my passion and livelihood, I want to just smile and walk away. We were presented with our meal and sunk our teeth into the moist saucy dark meat. In customary fashion, we ate with our hands, and covered our cheeks with the sauce, only stopping for air and to murmur, “holy crap this is amazing”. It’s hard to say exactly why the chicken was so good. Maybe it’s because some of the best things in life are the most simple or maybe because we had attained our goal. 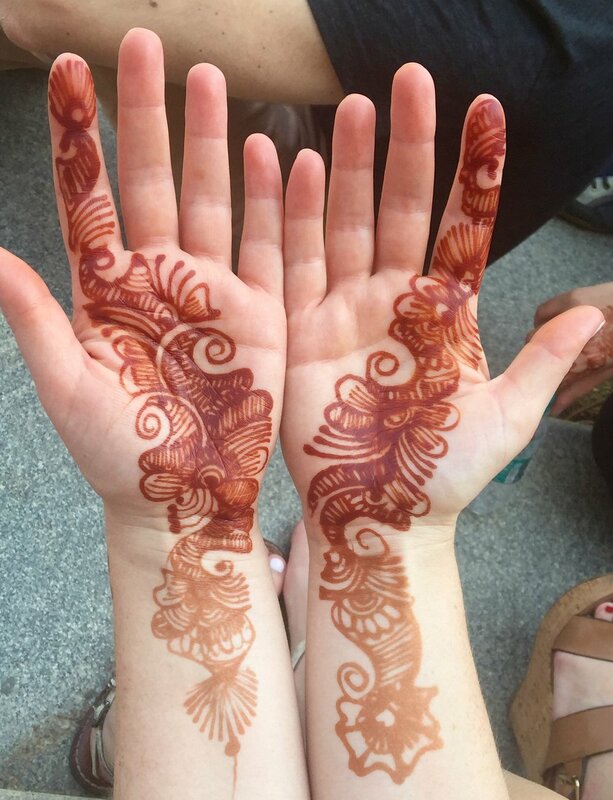 But looking back I like to think it was because in that moment, we were all truly present, sharing amazing food and embracing a foreign culture, surrounded by friends and loved ones. Wanderlust is more than just a desire to travel; it is a way of life that forces you to break a routine and allows for the discovery of the unexpected.